Fresh Backgrounds to Kick off September! Okay so September isn’t here just yet, but we’re getting started early with another bundle of campaign background updates. Here’s what we’ve got going up this week. You remember a few weeks ago when we rolled out some new backgrounds for you guys? Well guess what, there’s more where that came from! Remember each background also comes with a complimentary color scheme for you campaign so that you can just pick it and go to town. Let’s discuss this week’s batch! A while back you may recall that we were looking to hire a background designer, and we are happy to announce that that role has been filled! Today we are rolling some out as we speak! You should see more backgrounds as time goes on on a pretty regular basis, each time I’ll give you guys an update here on the blog talking about each one a little bit. Remember that each background also comes with a complimentary color scheme for you campaign so that you can just plug it in and go get back to the important stuff! New Content Director, New Contest! Seeking High-Res Backgrounds, User Feedback, Long Walks on Beach. 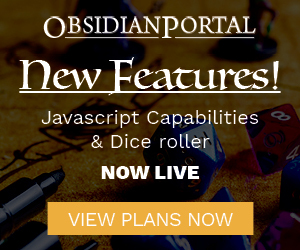 A new year brings a lot of room for fresh ideas, new goals, added features and of course growing the ever-expanding library of awesome content that gets poured into Obsidian Portal on a daily basis. Rolling the calendar over another year also means new opportunities and more specifically in this case, a new Content Director! My name is Jerry LeNeave and I just happen to be that new guy, I hope you’ll bear with me as I shimmy myself into this fine suit of armor Dan has left behind. We wanted to open 2011 with a bang, so Ryan and I worked hard over the holiday break to get these two features ready to go. They’re both in need of a little polish, but that’s never stopped us from launching something before.